The standards listed below have been replaced by a newer set of standards. Please go to Current 8th Grade Language Arts Standards for current resources. Formulate appropriate questions during the reading of the text. Asking Questions - the types of questions depend on the answer to that first important question: Why am I reading this? Once you establish a purpose for yourself, you can then ask which questions will help you achieve that goal. This page asks students to rank a set of questions on a scale of one to five. Choose the correct meaning/usage of a multi-meaning word by replacing the word in context with an appropriate synonym or antonym. Synonym.com - type a word in the box and find a synonym, or antonym, of the word. Say it Another Way - Fill in the blank with a synonym for the missing word. The Thesaurus - a reference book that lists words and their synonyms - Drag and drop the words to the right thesaurus entry. Locate information using available text features (e.g., maps, charts, graphics, indexes, glossaries, table of contents, and appendices). Reading Headlines - Match the newspaper headlines on the left to the newspaper section on the right. Identify on a graphic organizer the points at which various plot elements occur. Identify an appropriate title to reinforce the main idea of a passage or paragraph. Main Idea - The main idea of a passage or reading is the central thought or message. Summarize as You Read - When you summarize, eliminate unnecessary details. Focus on the main idea of the whole passage. Determine cause and effect relationships in context. Cause and Effect Graphic Organizer - Use this to help determine relationships. Cause-and-Effect Writing Challenges Students - The cause-and-effect relationship is both a way of thinking and a format for writing. Teachers who emphasize cause-and-effect writing say that they are helping students learn to think critically as well as write cogently. Read what three experienced teachers have to say about this teaching approach, which can be used with students of all ages. This is an article from Education World magazine . Determine inferences from selected passages. Inference Notes - Use this diagram to help interpret inferences. Rules of Inference - Lesson discussing the rules of inference. Recognize a reasonable prediction of future events of a passage. The World's Greatest Contralto by Babette Albin - As you read the story, write your questions and ideas about it on another sheet of paper. Then complete the next page. Prediction Guide - Guided questions help students in making, grounding and revisiting their predictions. Select information using keywords and headings. Recognize and use grade appropriate and/or content specific vocabulary. Rootonym - Level 1 | Level 2 | Level 3 - studying the roots/cells: cess/ced, cept/cip and cur . Vocabulary University - acquire and retain vocabulary. 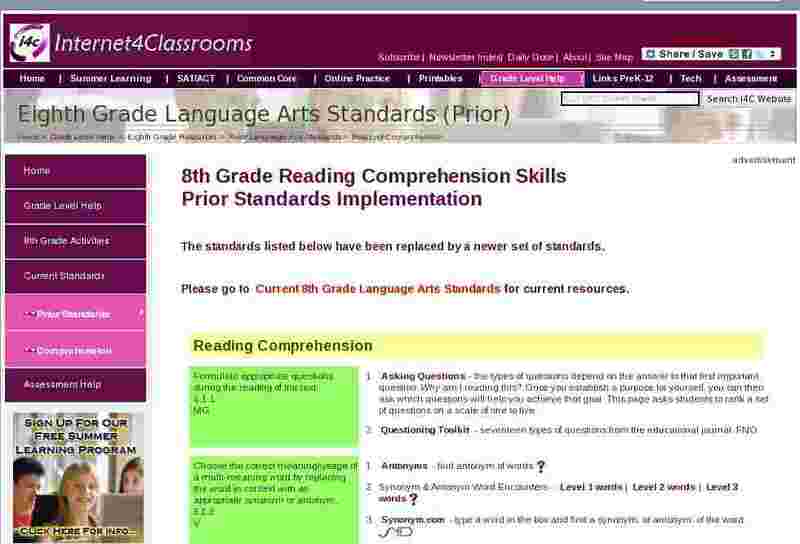 Determine an author�s purpose for writing or a student�s purpose for reading. Writing to Persuade - Persuasion means making someone with a different point of view from your own change their mind to your way of thinking. Sample assignment - Invent an X-ray satellite, name it, draw a picture of it. Write a one- to two-page persuasion letter addressed to your Congressperson or essay for your local newspaper in order to obtain funding for your X-ray astronomy mission. Writing to Persuade Rubric - Perhaps your students can understand writing to persuade better by seeing this rubric. Identify an implied theme from a selection or related selections. Use text features (e.g., sidebars, footnotes, and endnotes) to determine meaning. Distinguish among different genres (e.g., poetry, drama, letters, ads, historical fiction, biographies, autobiographies, and essays) and their distinguishing characteristics. Identify examples within context of similes, metaphors, alliteration, onomatopoeia, personification, and hyperbole. Alliteration or Simile - Choose whether each statement is an alliterative phrase, simile or neither. Poetry writing practice web . Similes and Metaphors - Identify the comparison in each sentence as a simile or a metaphor [ignore the email address blank]. Choose a logical word or phrase to complete an analogy, using scrambled words and homophones in addition to previously learned analogies. Recognize and identify the techniques of propaganda (i.e., bandwagon, loaded words, and testimonials). Text Types- Online game helping learn about the different text types such as persuasion, informative, descriptive, or instructive. Analyzing Political Ads - Students will view current political ads and learn how they make use of various commercial ad appeals. Students will also develop familiarity with basic videography terms. Affluenza: A PBS Program - Lessons such as "Be an Adbuster!" and "What are Advertisers Selling?" are based on Affluenza, a one-hour television special that explores the high social and environmental costs of materialism and over consumption. The lessons can be used without the video. Recognize the author�s point of view (i.e., first person, third person, limited, or omniscient). Characters and Point of View - " The point of view -- how you choose to tell your story -- determines the voice of your writing." Determine how a story changes if the point of view is changed. Recognize commonly used foreign phrases (e.g., e pluribus unum, c�est la vie, bon jour, hasta la vista, bon voyage, mi casa es su casa). Foreign Words and Phrases - The English meanings given are not necessarily literal translations. Common foreign phrases - Select a language and find familiar phrases. Common Foreign Words and Phrases - How many foreign phrases do you know? Can you guess the translation? Identify examples of sound devices within context (e.g., rhyme, alliteration, assonance, slant thyme, repetition, and internal rhyme). Recognize and identify words within context that reveal particular time periods and cultures. Determine the influence of culture and ethnicity on the themes and issues of literary texts. Proverbs Around the World - Analyze information and assess meaning from prior knowledge - Print this sheet and have group discussions on meanings. Identify how the author reveals character (e.g., physical characteristics, dialog, what others say about him, and what he does). Writing Dialogue - "Personally, I think dialogue can make or break a story. Here are some tips I�ve discovered that may help you with yours," said Elizabeth Rose. Writing Dialogue - This is a dialogue sheet which can be used to teach students to include the basic characteristics of good dialogue in their own writing. The form may be modified to include whatever characteristics the instructor desires. Recognize literacy elements that shape meaning within context (e.g., symbolism, foreshadowing, flashback, irony, mood, and tone). Identify instances of bias and stereotyping in print and non print contexts. Using Picture Books to Explore Identity, Stereotyping, and Discrimination - Lesson plan with handouts. Recognize the effect of stressed and unstressed syllables to aid in identifying the meaning of multiple meaning words. Stressed and unstressed syllables - Use these rules to help with base words. Word emphasis - change meaning of sentence by the stress put on words. Read a passage and answer questions to show comprehension. Eighth Grade Reading - Read the introduction and the passage that follows. Then read each question and mark the circle next to the correct answer. Reading Comprehension stories - Interactive quizzes online for 5 stories - Each text is followed by a grammar exercise and summary writing exercise. Identify individual written selections as technical, narrative, persuasive, and/or descriptive in mode. Which Writing? (6-8) Students choose an appropriate format for writing. Eight Grade Reading Test - Online quiz that covers most areas of Standardized testing. Click on Return to Program to begin test. Online Practice for Reading - Many choices of text selections - Choose specific activity from the frame on the left to practice skills. Cloze Tests Exercises - Scroll to find Cloze tests in the list of Tests and Exercises. Cloze Test: (Reading test - Proficiency level) - Students are to complete the text with one word in each gap. Cloze Test: (Exploration - Why in the World?) - Students are to complete the text with one word in each gap. Cloze Test: (Juliet) - longing for Romeo to arrive - Act III, Scene 2. Cloze Test: (The Chink) - A long (and fairly difficult) cloze exercise about the experiences of a young man of Japanese extraction during World War Two.